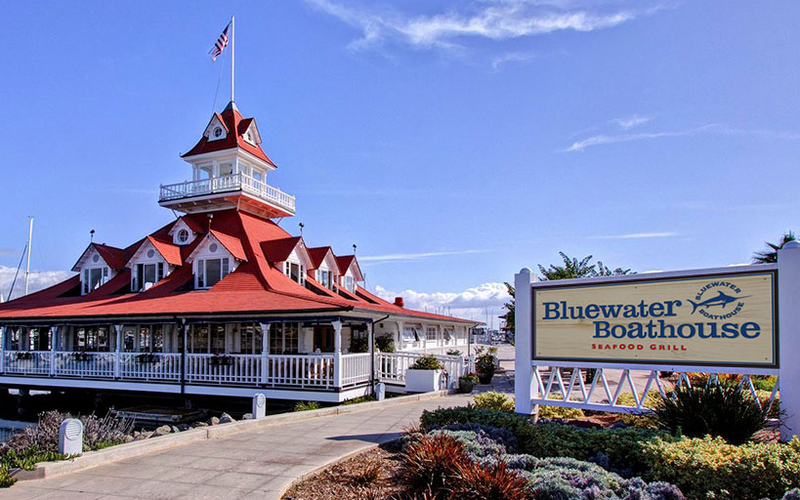 A dockside restaurant built in a 130-year-old boathouse, formerly part of the Hotel del Coronado. Seafood is on the menu, ranging from freshwater fish to saltwater and shellfish. Dog-friendly patio overlooks a Glorietta Bay marina, so those with boats can park in the water. Sunday 3-6pm: $5 craft and imported bottled beer, $6 house wine and champagne, well drinks. $4 charred edamame, salt and vinegar fries, oyster shooters, crispy calamari. $6 grilled fish tacos, blackened fish bites, seafood ceviche, asian drumsticks. $8 grilled artichoke, crispy oyster sliders, bar burger, crab & artichoke dip. Monday 3-6pm: $5 craft and imported bottled beer, $6 house wine and champagne, well drinks. $4 charred edamame, salt and vinegar fries, oyster shooters, crispy calamari. $6 grilled fish tacos, blackened fish bites, seafood ceviche, asian drumsticks. $8 grilled artichoke, crispy oyster sliders, bar burger, crab & artichoke dip. Tuesday 3-6pm: $5 craft and imported bottled beer, $6 house wine and champagne, well drinks. $4 charred edamame, salt and vinegar fries, oyster shooters, crispy calamari. $6 grilled fish tacos, blackened fish bites, seafood ceviche, asian drumsticks. $8 grilled artichoke, crispy oyster sliders, bar burger, crab & artichoke dip. Wednesday 3-6pm: $5 craft and imported bottled beer, $6 house wine and champagne, well drinks. $4 charred edamame, salt and vinegar fries, oyster shooters, crispy calamari. $6 grilled fish tacos, blackened fish bites, seafood ceviche, asian drumsticks. $8 grilled artichoke, crispy oyster sliders, bar burger, crab & artichoke dip. Thursday 3-6pm: $5 craft and imported bottled beer, $6 house wine and champagne, well drinks. $4 charred edamame, salt and vinegar fries, oyster shooters, crispy calamari. $6 grilled fish tacos, blackened fish bites, seafood ceviche, asian drumsticks. $8 grilled artichoke, crispy oyster sliders, bar burger, crab & artichoke dip. Saturday 11am-2pm: $9 build your own Bloody Mary bar, $4 refills. Monday 11:30 a.m. to 9 p.m.
Tuesday 11:30 a.m. to 9 p.m.
Wednesday 11:30 a.m. to 9 p.m.
Thursday 11:30 a.m. to 9 p.m.
Friday 11:30 a.m. to 9:30 p.m.